Easy 4th of July Recipes for Kids! In America, July 4th is a popular day for parties and celebrations to show their patriotism to their country. 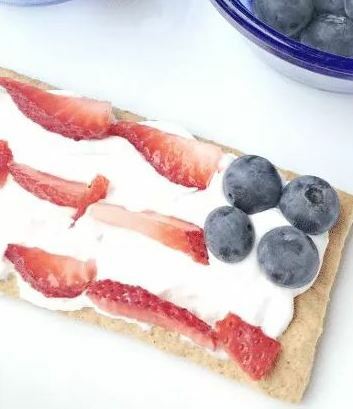 Here are some amazing red, white and blue snacks that will have the stamp of approval from those picky eaters, the kids. Better yet, these recipes are so fun the adults will love them too. It’s so easy that the kids could even make their own at the party if you need an activity to keep them busy. These flag cookies start with a graham cracker then adds frosting or whipped topping on top. To finish the cookies you’ll add blueberries and strawberries and design your own American flag. Foods that come in bite sizes are great for kids! Many of them tend to be food grazers, eat a bit here and little there and that is why these yogurt bites are a great snack idea for your party. 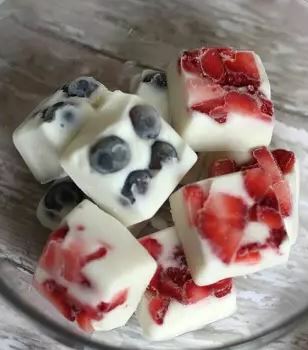 All you’ll need to make these yogurt bites is vanilla Greek Yogurt (or your favorite yogurt), strawberries and blueberries. Once you have your ingredients it’s as simple as dicing up the fruit, place in a silicone mold and then cover with your favorite yogurt. To set them you’ll want to place them in the freezer for at least 2 hours and then they are ready to enjoy! These ice cream sandwiches will be the go to for of all the kids at your party but make sure to prepare extra because the adults will want in on the fun too. They’re so easy to make that you could even the kids can join in on the assembling part. All the ingredients are store-bought so no baking or cooking required. 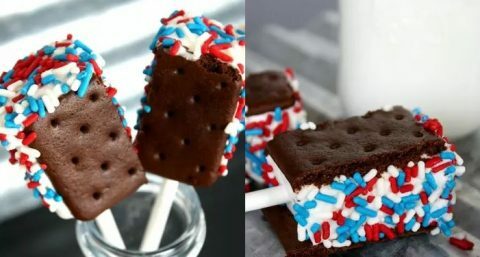 You’ll start with regular sized ice cream sandwiches and then secure them onto a lollipop stick to make the perfect ice cream sandwich pop. For an added touch of the red, white and blue theme roll the ice cream sandwiches in sprinkles. July is also National Hot dog month! They are salty and savory and are often a crowd pleaser especially when it comes to the kids. 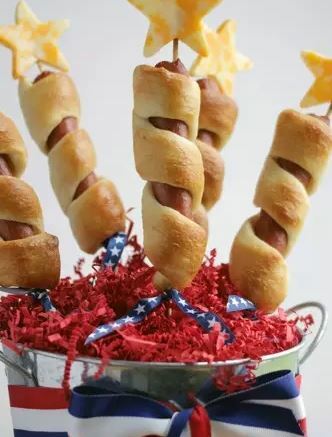 These firecracker dogs start with an ordinary hot dog and are then wrapped in breadstick dough and are baked to a golden perfection. To make them extra festive serve them in a red white and blue decorative bucket and top them off with star-shaped cheese. Kabobs are not only for the grill, they make great no-grill snacks too. 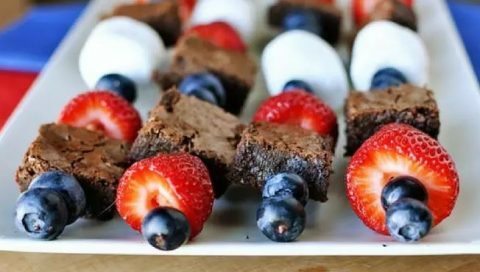 These red white and blue kabobs are perfectly balanced with healthy fruit and sweet delights like brownie bites and marshmallows that the kids will surely gobble up. All you’ll need to assemble these yummy kabobs is fresh blueberries and strawberries, large marshmallows and brownies of your choice. You could even drizzle them with hot fudge sauce prior to serving for presentation and for added chocolatey flavor. Happy 4th of July from the Stacey Feltman Group, Ebby Halliday Realtors! ENGAGING A REAL ESTATE PROFESSIONAL IS KEY! June 2018 Real Estate Market Stats- Still Strong! OMG! This wonderful lady was Awesome! From the first day that I made contact with her until the day I obtained the keys to my dream home. She first greeted me with a hug and from then on I felt like she was in my corner 110%. She constantly stayed on top of my preferences and sent me daily properties until I finally found something that I fell in love with. She strategically helped me with the bidding process and from there we were able to secure a signed contract with seller. She even went the length my permission, to establish a sound relationship with my loan officer so they could work as a team to get me closed as soon as possible. I never had a complaint at any time during this process. She was always available for me to ask any questions even though my work schedule sometimes caused me to have to contact her at not so traditional hours. She had the ability to make me feel like I was her only client. I will never forget this wonderful experience and would recommend her to anyone who is looking to purchase or rent a property. Stacey, thank you so much for being the professional, hard working person that you are. I really did take advantage of it!! How is a real estate transaction like a football game? How will rising interest rates affect home ownership?